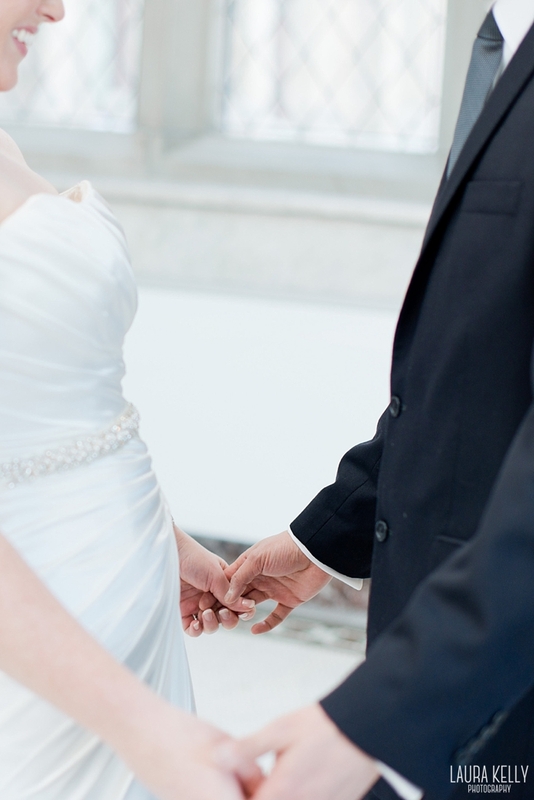 Laura Kelly Photography Blog :: Ottawa Wedding and Engagement Photographer: multiple perspectives from couples who chose a "first look"
multiple perspectives from couples who chose a "first look"
"Should we do a first look on our wedding day?" It's a common question to receive during the initial consult, but truthfully, I never want to push too hard one way or the other. The last thing I would want is to convince a bride to see her groom moments before the ceremony, only to have her regret it later. I will admit that some of my favourite wedding photos ever have been in those private, quiet moments before the walk down the aisle (and to my knowledge, I've never had a bride regret her decision to do a first look). ONE: If you're planning a Winter wedding. From November until February in this beautiful (& cold) city of Ottawa, photos need to be wrapped up by about 4:00pm to ensure we have good lighting. Most ceremonies don't begin until 3:00pm at the earliest, so trying to cram in photos of the family, the wedding party, and of course, the bride & groom, proves almost impossible without getting started a few hours earlier. TWO: If you're planning a ceremony in a dark church. 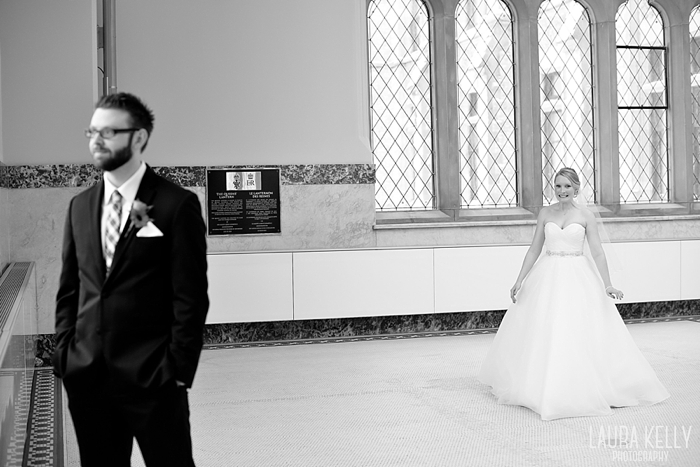 If you're getting married in a dark church, it is difficult to beautifully document your husband's reaction during your walk down the aisle, so if this is important to you I would suggest finding time for a first look (even if it's just a few minutes before the ceremony begins!). Beyond lighting issues, churches also create some difficulty navigating around restricted areas, so capturing multiple angles isn't always possible. 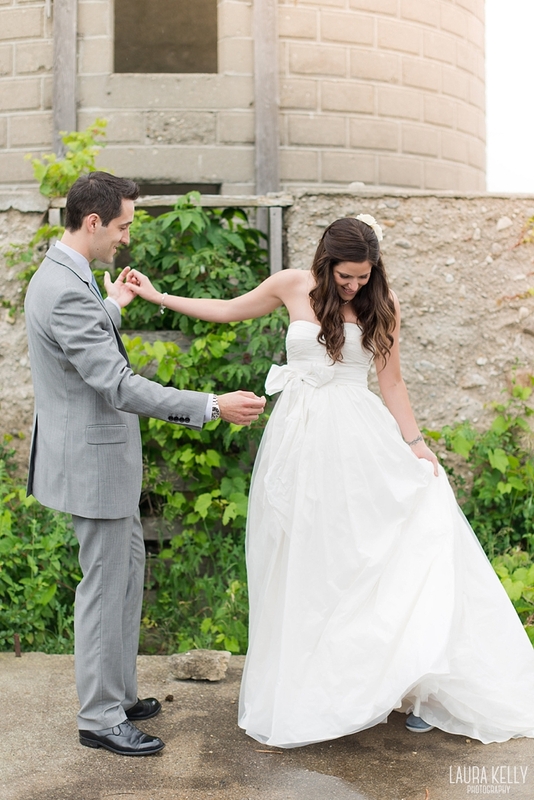 THREE: If you think you might shed a few tears during the ceremony. If you're planning to cry, sweat, or potentially get rained on during the ceremony, you may want to consider doing a first look so that your formal photos are done with a fresh face of makeup, and hair that's still looking as beautiful as when you left the salon. You might find that once your formal couple photos are finished, you breathe a little easier knowing you can give in to your emotions. 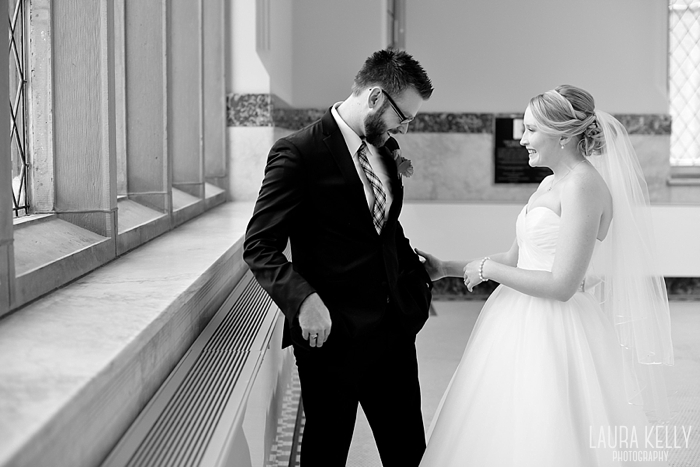 "I am so happy that we chose to do a First Look! The whole morning of the wedding went by so fast while getting hair and makeup done, making sure all the bridesmaids were on time, remembering to pack everything I needed for that night, etc. When we arrived for the first look it was like everything just slowed right down. There was no rush, there were no groups of people, it was just me and Brent. We chose not to bring our whole wedding party or any family to the first look and this was the best decision that we made. It gave us time to just experience part of the day together without the stress of organizing big groups or dealing with anxious parents. It was just about the two of us and having some time together to just take it all in and ensure that we had a beautiful collection of photos of the two of us on our wedding day. The First Look was one of my favourites memories from our wedding day and something that I recommend to all my engaged friends. Witnessing his genuine reaction to seeing me for the first time and being able to experience that just the two if us was wonderful. It is true when they say that your wedding day goes by so fast, and I am so happy that I planned some time into my day to just be with my new new husband and revel in what we were about to do together." 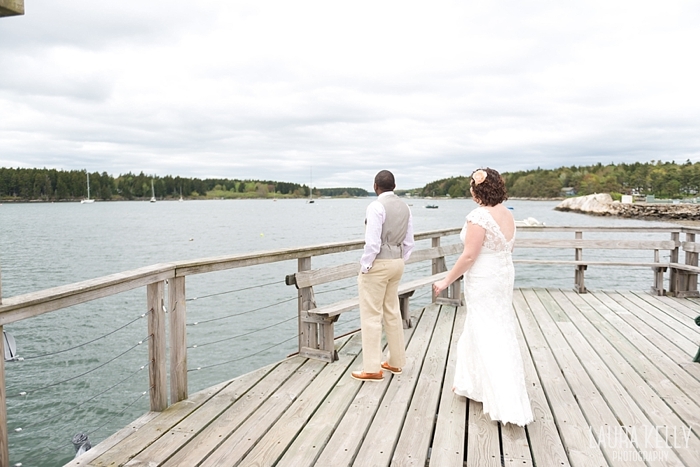 "I first become aware of "first look" photos when I started looking at wedding blogs after becoming engaged. Whenever I saw the photos, I thought they looked so lovely, but I also wondered if it took something away from the actual ceremony, by robbing it of the actual "first look". When we started to plan our wedding, and we picked our middle of the winter date, were made aware of the availability of the church, and consulted with Laura, we realized that if we wanted to have photos in daylight, we really had no choice but to do a "first look" before the ceremony. My husband is quite traditional, and was a little uncertain - but we decided it was what made the timeline of the day work the best. We didn't stay together the night before the wedding, and we didn't see each other at all the day of the wedding. I felt really excited all day, and the excitement only increased as we got closer and closer to the "first look" and ceremony time. The day was going by so fast, and it was so lovely, but didn't really feel like "real life". By the time we arrived at the "first look" location and it was time to get things moving, I really felt like I was going to be sick - it was just SO exciting but I also felt REALLY nervous! By the time my now-husband tapped me on the shoulder my butterflies were going crazy, and when I turned around, it felt like the biggest sigh of relief. We both laughed and I had this incredible sense of calm - that although the day was exciting and different - it really was just me, and my best friend, doing this thing that we couldn't wait to do. It gave me an amazing moment to let go of all of the planning stress and busyness and really be more present in the moment. Instead of feeling super nervous, I just felt really happy and excited. It made me feel more like we were approaching this together." 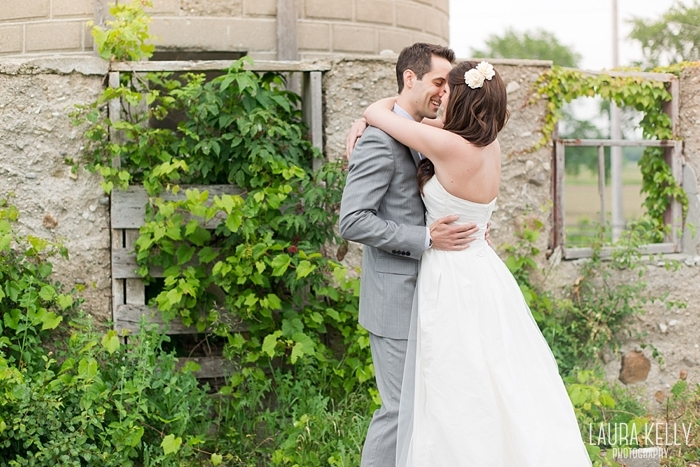 "I loved doing a first look! I was very apprehensive at first as I always had it in my head that my groom shouldn’t see me until I walk down the aisle. We didn’t officially decide until the day before that we’d like to do a first look but sooooo glad we did. We spent almost a year planning a party and we didn’t want to miss any of it! Being ready a couple hours early to do our portrait shots worked great. I didn’t feel rushed at all as I think I would have if we were trying to get the pictures over with so we could get to see our friends and family sooner. We didn’t have a wedding party, so I’m not sure how it would have worked in that aspect. Doing a first look also meant I had a time to touch up my make up before the ceremony. I did NOT feel like I missed out on the butterfly feeling I had always expected before walking down the aisle. I had them when I was walking up to my groom for the first lookand again right before the ceremony! Giddy, nervous and excited! Our photos are stunning and Laura was able to be more creative with our photos and styling since we didn’t have as strict of a timeline! The first look photos themselves are very special and those looks on our faces would not have been captured in a ceremony situation." "There was never any question for me about doing a first look, I knew I wanted to do it. 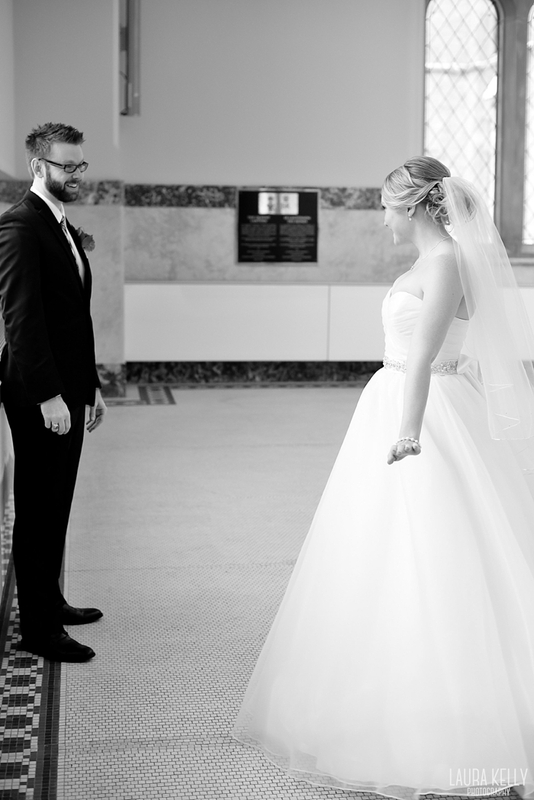 I really felt that the moment he saw me for the first time as his bride should be something special that we shared just between us. I knew I wanted to take some time with him before we had the ceremony. The day will go by in a blur, so many things will be happening, so many people will be around, it was nice to spend that time uninterrupted, together. Plus, it really took the pressure off at the ceremony. 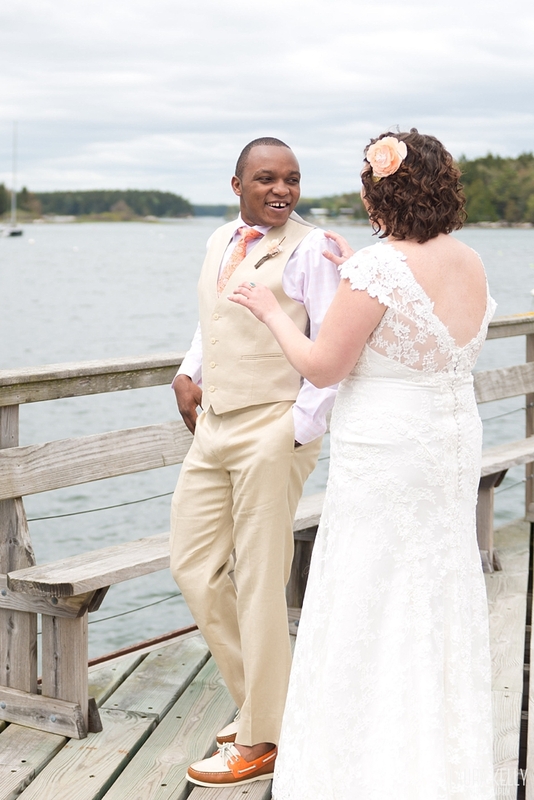 So many people will be looking at you and taking your picture, it was nice to not miss all of that because I was too focused on my groom and wondering what he was thinking. Some of my favourite images are from the first look. It was cool because I didn't even notice Laura taking our photos, I really felt like it was just us! 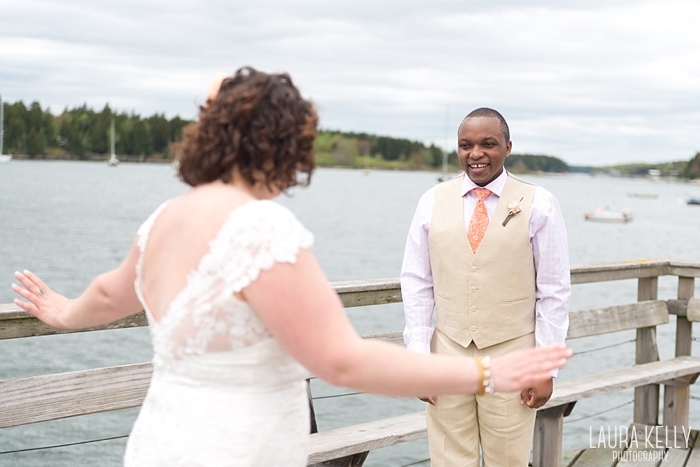 I also don't know if it would have been possible to capture our reactions to each other in the same way had we opted to wait until the ceremony. Another reason we did the first look was for practicality; our wedding was later in the afternoon so it made sense to get the bulk of the photos done before. I asked my husband what he thought of the first look and he said he was excited to see me for the first time but thought he'd be a bit more nervous if he had to wait until the ceremony. I am so happy that I did the first look. I've even convinced my soon to be sister-in-law to do one for her wedding next summer as well!"